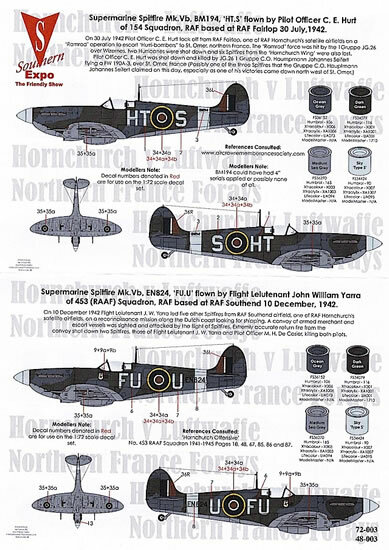 The 2011 “Hornchurch v Luftwaffe” decal release by the Southern Expo Model Show, “Lean into France”, featured 11 RAF and Luftwaffe fighters that opposed each other across the Channel in late 1940 and 1941. 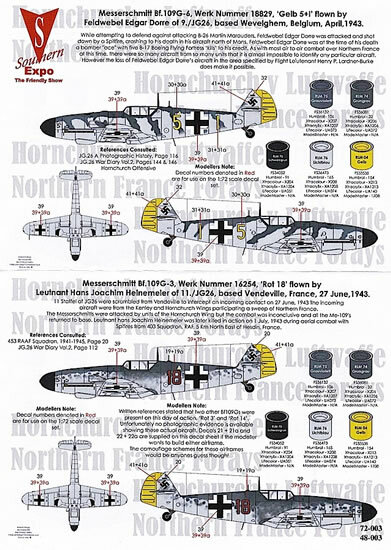 This year’s release, “Northern France Forays”, continues the story from July 1942 to August 1943, highlighting the exploits of six RAF and four Luftwaffe pilots and their aircraft. 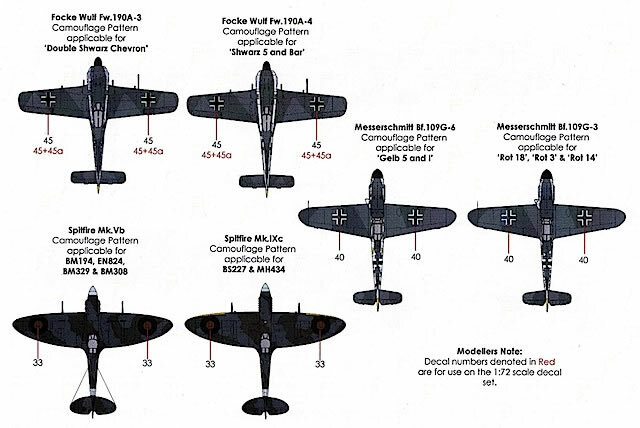 As with previous Southern Expo releases, the RAF aircraft were all based at either RAF Hornchurch or airfields with a close affiliation to Hornchurch; the German aircraft are all from JG26. Spitfire Mk.Vb, BM194/HT-S, flown by Pilot Officer C.E. Hurt of No.154 Squadron, RAF Fairlop, 30 July 1942. Spitfire Mk.Vb, EN824/FU-U, flown by Flight Lieutenant John William Yarra of No.453 (RAAF) Squadron, RAF Southend, 10 December 1942. Spitfire Mk.IXc, BS227/FU-U, flown by Pilot Officer J.H. Ferguson of No.453 (RAAF) Squadron, RAF Hornchurch, 27 June 1943. Spitfire Mk.IXc, MH434/ZD-B, flown by Flight Lieutenant Henry P. Lardner-Burke of 222 ‘Natal’ Squadron, RAF Hornchurch, 27 August 1943. Messerschmitt Bf 109 G-6, W.Nr.18829/‘Yellow 5+l’ flown by Feldwebel Edgar Dorre of 9./JG26, Wevelghem, Belgium, April 1943. Messerschmitt Bf 109 G-3, W.Nr.16254/‘Red 18’ flown by Leutnant Hans Joachim Heinemeier of 11./JG26, Vendeville, France, 27 June 1943. Focke-Wulf Fw 190 A-3, W.Nr.5305/‘Double Black Chevron’, flown by Hauptmann Johannes Siefert of l./JG26, St Omer-Arques, France, May 1942 . As usual for a Southern Expo decal release, the painting and marking guide is excellent. 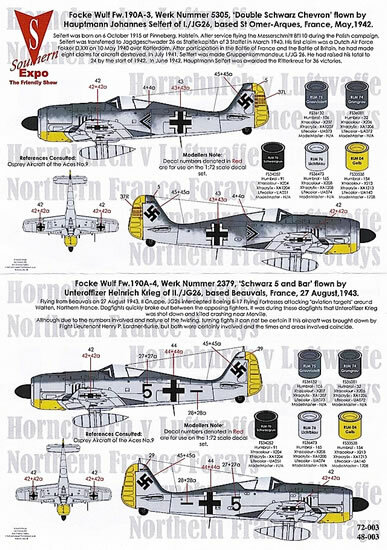 Full colour four-view drawings are provided of each aircraft, with clear instructions for decal placement. Paint call outs are provided in RLM, US Federal Standard, Humbrol, Xtracolour, Xtracrylix, Lifecolour and Model Master numbers – an outstanding range that will leave modelers in no doubt about the colours they need to use. Also very welcome is the amount of information that is included about each aircraft and its pilot, which is an excellent starting point for anyone who wants to conduct further research. The decals are of high quality, with good colour, density, and some fine detail in both 1/48 and 1/72 scale. 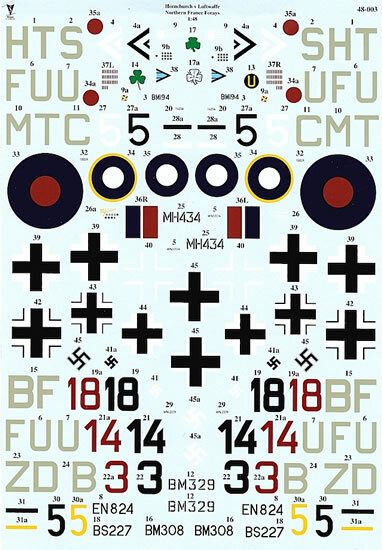 Most of the national markings on the 1/72 sheet are printed in several parts, presumably to avoid any issues with registration. This is only done with a couple of the RAF markings on the 1/48 sheet, where the central red dot of the fuselage and underwing roundels has been printed separately. 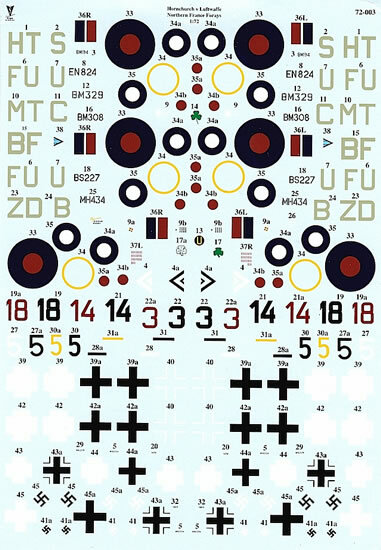 Ironically, the 1/48 fuselage roundels are the only decals on either sheet that appear to suffer from registration problems, with the outer yellow ring printed slightly off centre. However, replacements for these should be easy to find, and the rest of the decals are exemplary. No stencils are provided, but given the types of aircraft featured, these should not be difficult to find. 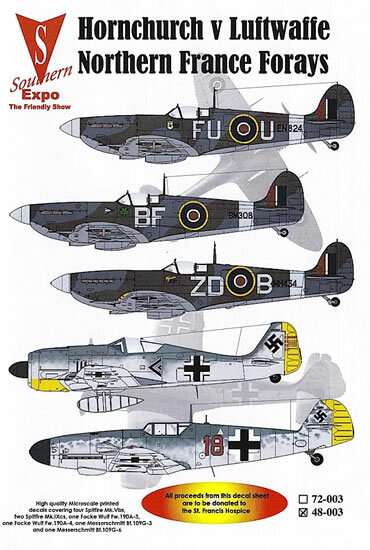 “Northern France Forays” is a welcome addition to Southern Expo’s history-through-decals of the air war on the Channel front. Hopefully there will be another release next year, which picks up the story from mid-1943 as the contest tipped increasingly in favour of the RAF.